SmartJack® Crawl Space Jacks is a corrosion-resistant, adjustable support system that's been designed for repairing sagging crawl spaces. This unique, award-winning system will stop the downward movement of your crawl space structure, while also providing the opportunity to attempt to lift the floor back up to its original position -- without damaging your structure. The rugged design of this crawl space jack system can support vertical loads exceeding 60,000 pounds, making it up to four times the load-bearing capacity of similar products. And despite its strength, it remains small, versatile, and installable even in narrow spaces. 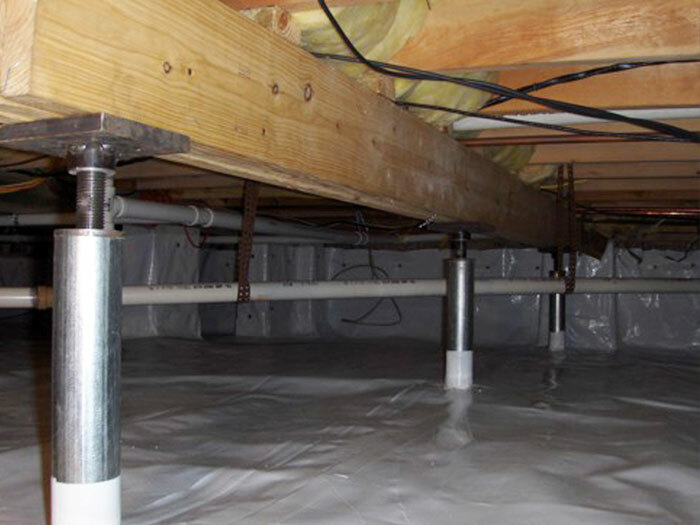 Our warrantied crawl space support system is just what you need to ensure a reliable, permanent repair for your home. Our system can be installed in one, perhaps two days in your home. To schedule a free, no-obligation crawl space repair quote, contact us by phone or e-mail today! Our Certified Crawl Space Specialists serve throughout Canada, the United States, and the United Kingdom -- including your local neighborhood! Light-duty crawl space jacks, such as the ones found in box stores, are not up for the long-term challenge of supporting your home. As time passes, they will rust and corrode, making them impossible to readjust over time. 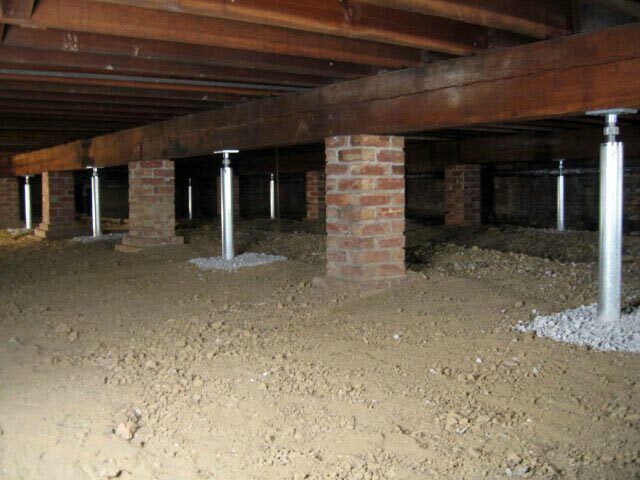 No matter how strong your crawl space support posts are, they will not be able to hold up the weight of the house if the soils underneath them aren't strong enough to bear the weight. Crawl space support posts often sink into the ground over time. And as they do, the structure sags with them, and the contractor will need to be called back. Before a SmartJack® is installed, a 2' by 2' hole is excavated. The hole is filled in with crushed stone and is mechanically compressed. This cube of compressed, crushed stone disperses the weight pressing down into the soil outwards, applying an engineering principle known as the "bulb of influence [pdf]". By the time the transferred weight reaches the soil, it has dissipated to approximately 10% of the at bearing surface. So even if your soils aren't very strong, they will be able to support the weight of the SmartJack's bearing load. How Do Other Methods Measure Up? There are several methods of crawl space repair being used these days -- some which contractors have installed their entire life and would swear by if asked. If the other repair methods never worked, no one would use them anymore. But at Basement Systems, our International Network's reputation depends on a solution that will be permanent -- and will work all the time. 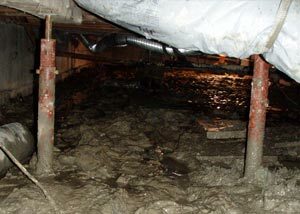 Addresses the issue of crawl space supports that are spaced too far apart to properly support the structure. Can be easily and reliably adjusted for future repairs to the crawl space. Can be usually be installed within a day. Provides a high load-bearing capacity for structural support. Bear In Mind: If your crawl space is sagging due to mold or rot, none of these solutions will work without a crawl space encapsulation system installed. Otherwise, the wood you use to replace the rot-damaged wood will also become damaged over time in the moist environment. By sealing the crawl space and installing a crawl space dehumidifier, you will control the mold and rot, thereby preserving the home and retaining the value of the repairs. Our system provides a permanent, warrantied repair for your crawl space! Our system installs quickly, can easily be adjusted, and addresses all sources of crawl space structural failure. Contact us today to schedule free crawl space structural repair quote! Your local dealer will inspect your structural issue, take measurements, and advise you on how many SmartJack's will need to be installed to restore your structure. We'd be glad to answer any questions you have during our visit, and we'll provide you with a free, written cost quote for all repairs. Before our visit, we'll also mail ahead a complimentary copy of our crawl space repair book! This detailed, full-color guide is packed with information about crawl space issues of all kinds, as well as which repairs we recommend for each one. Our Certified Crawl Space Specialists proudly serve throughout Canada, the United States, and the United Kingdom. We've helped hundreds of thousands of homeowners over the past decades, and we look forward to working with you! 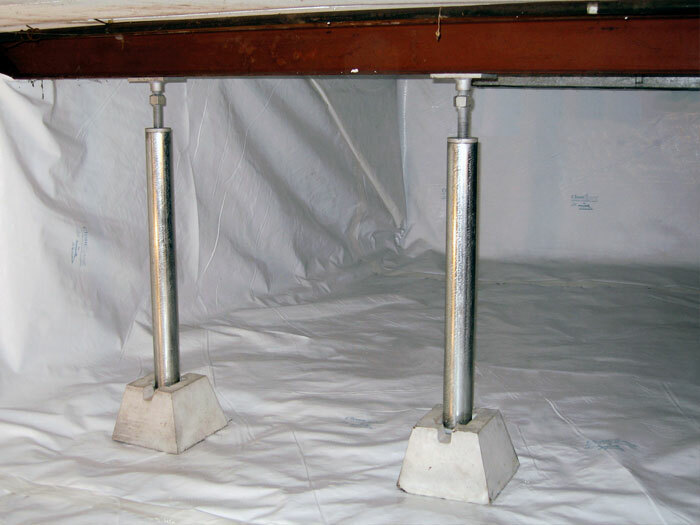 When additional shimming is added to a crawl space support posts, the floor must first be mechanically lifted to above its original position with temporary jacks. 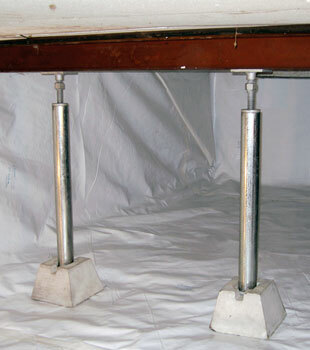 This over-lifting can potentially cause structural damage to the home. If too few supports are the cause of the cause of the sinking, the floor will continue to be poorly supported, and will continue to sink. If the columns have sunk because the soil was too weak to support the weight, they will probably continue to sink. 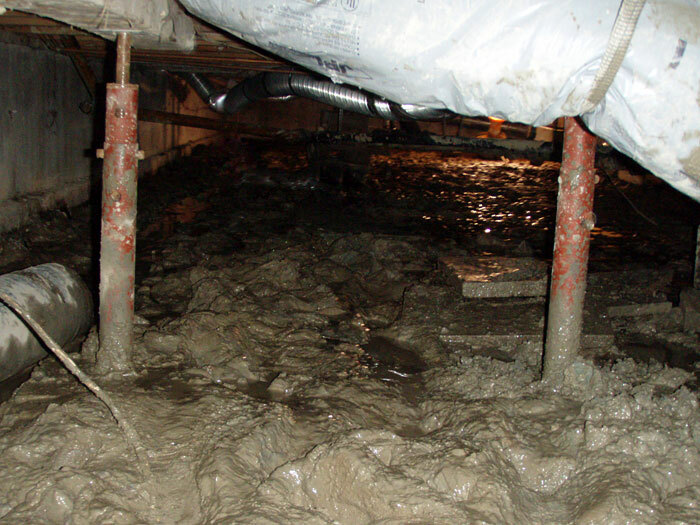 Sometimes, a contractor will address a sagging crawl space by adding additional concrete columns. These concrete blocks will be custom-made for the crawl space, and will need several days for the grouted-together block mortar to cure. If your crawl space is sagging due to rot, it will continue to sag after the repairs are made. Replacement beams will rot as well, unless the moisture issue in the crawl space is addressed. If the columns have sunk because the soil was too weak to support the weight, they may continue to sink into the soil. During installation, the crawl space jack post is extended until it reaches and supports the sagging girder. These posts typically have a low load-bearing capacity (15,000-18,000 pounds). 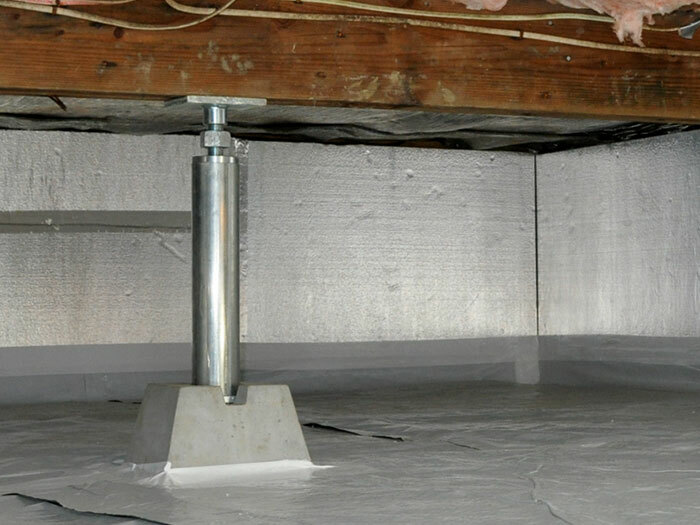 The SmartJack® is an adjustable galvanized steel (corrosion-resistant) post that is used to support a crawl space. It sits on top of a pre- cast concrete block. Underneath the block, a 2' by 2' cube of soil was removed and replaced with an engineered stone fill. The jack post is extended to the girder, halting movement. The SmartJack® is adjusted to attempt to lift the floor back to its original position -- a process that will not cause structural damage.